LG high CRI LED E2L flashlight-maybe this LED is unknow to everyone.. 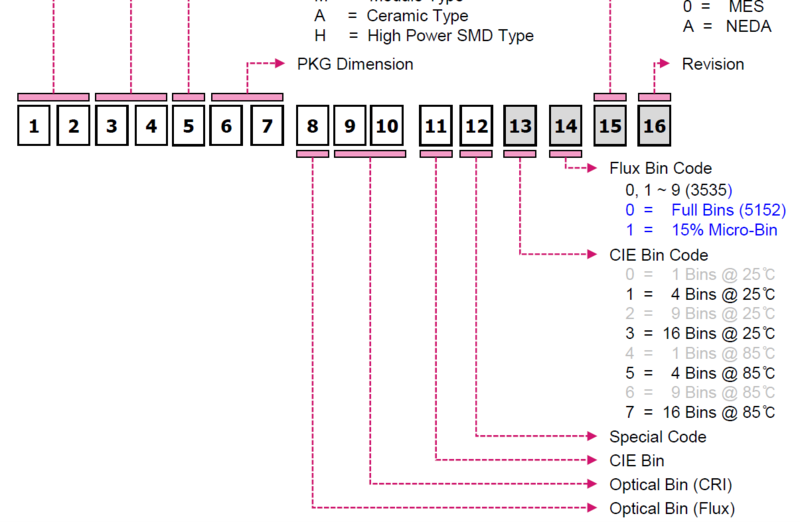 Does anybody have the datasheet of the LG LED? Maybe it’s unofficial or “confidential”. A guy I know has experimented with multiple Osslon LEDs and he thinks that the colortemperature makes a difference. His theory is that 4000K and above are greenish, but 3500K and below are not. All my 3000K 90CRI Oslons from second and third generation have an underwhelming tint, ok but slightly at the green side of yellow. As opposed to Nichia’s that are at the rosy side of yellow. I do have a girst gen. Square 3500K 80 CRI that has a great tint, also the first gen. SSL80 4000K 96 CRI is great. I did the performance test on the LG led of the OP and will do a full post hopefully later this week. *the maximum is at 8A (1733lm), pretty good for a 90 CRI led. The voltage is then 4.00V, so this led is pretty ideal for a direct drive single 18650 light. *my ideal drive current would be 5A, at which current the led is at 3.54V and 80% of the maximum output (1400lm). I looked at the tint for a brief moment at 50mA holding a small smooth reflector in front of the led, but I can not tell much about that yet, just that the hotspot seems to produce a ‘spiegelei’, which is pretty worrying for this led but it could be very well how I positioned the reflector in my hand. Is it only me that notice the model name is LEMWE33390SU5000 on the picture of the led reel package and not LEMWE33390HU5000 as the specifications picture show? This is the specifications for it? I did notice that, could be a newer (better) bin that was not there at the time the table was made. I would have to dig in the LG coding to find out what it is. Can just post the one for LEMWE33390HU5000 to. You see the “HU” specs say 3A max and “SU” is 2A max. I guess the number after the 333 is for the CRI. 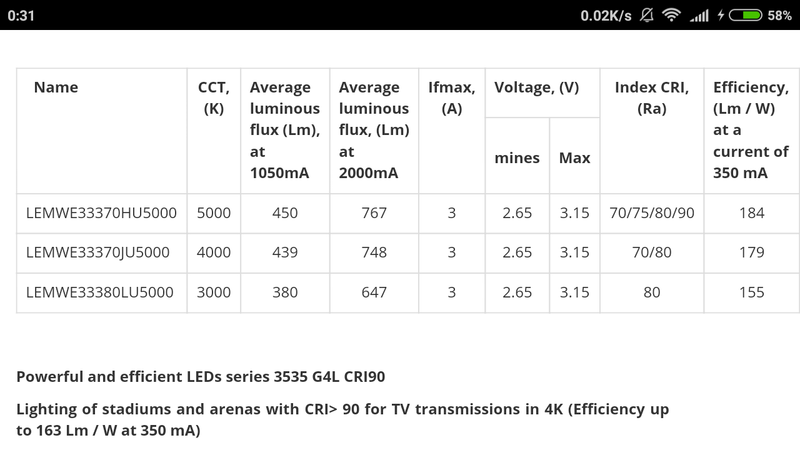 So LEMWE33370HU5000 is for the CRI 70 led. 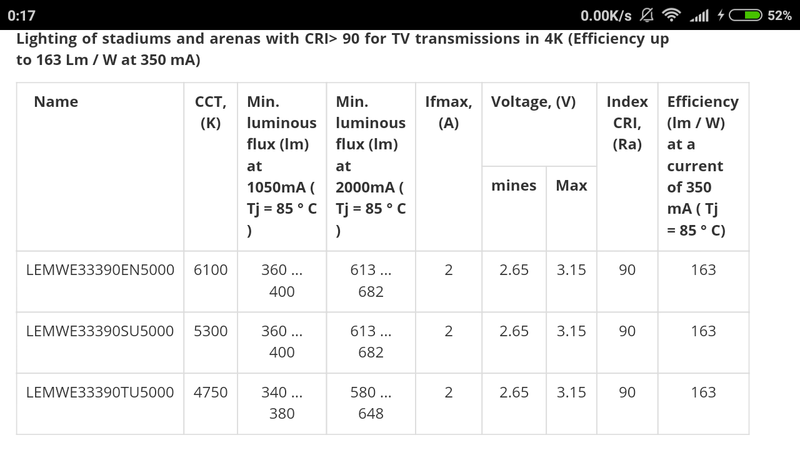 edit: those numbers was only for the CRI 70 led (but the 3A max is the same). See original post for numbers on the CRI 90 one. Thanks djozz! It seems efficient enough to think about using it. Can you maybe do some more testing with reflectors and/or optics? Haven’t tried Oslon SSL, but I did test one Osram Oslon for Chouster some time ago. It is hideously green regardless of drive current. Clearly, CRI isn’t everything. The CRIs are excellent but as you’ve said, the tint is hideous. Anyway, I just hope the LG isn’t like that. Mine arrived yesterday. I don’t have any quantitative test like djozz can provide (yet), but I did toss one into one of my standard setup P60 drop ins (5×7135 QLITE, OP reflector) just to check out the beam and tint. It isn’t great. Tint I would say is on the slightly greenish side, but pretty good overall for >5000k. The real problem is the beam. Serious “fried egg” in the hot spot. Right in the center of the hotspot is a very noticeable yellow, then the rest of the beam seems a consistent color. This is in all modes. I haven’t tried with a TIR yet so not sure how that would look. Looks decent as a mule though. I had ordered a complete E2L with this led some time ago, so will wait for that one for my TIR-verdict. LG E2L waiting in the post office. Looks like they don’t really work with reflectors so maybe testing them inside the light is sufficient for now. I hope they look better when used in triple or quad configuration with TIR optics. I think it’s fair to say that this is the most disgusting LED in a flashlight I’ve seen… (ok, maybe an exaggeration). Just look at the green/yellow tint, which varies all over the place in the beam. The cellphone beamshot doesn’t convey the true horror, but gives an idea of the shift within the beam. This is the first LED with a high R12 (deep blue) value, but CRI of only 89-90 instead of 95+. Orange (and green) is dominant in the spectrum. Purple is weakest. Skin probably doesn’t look so great? 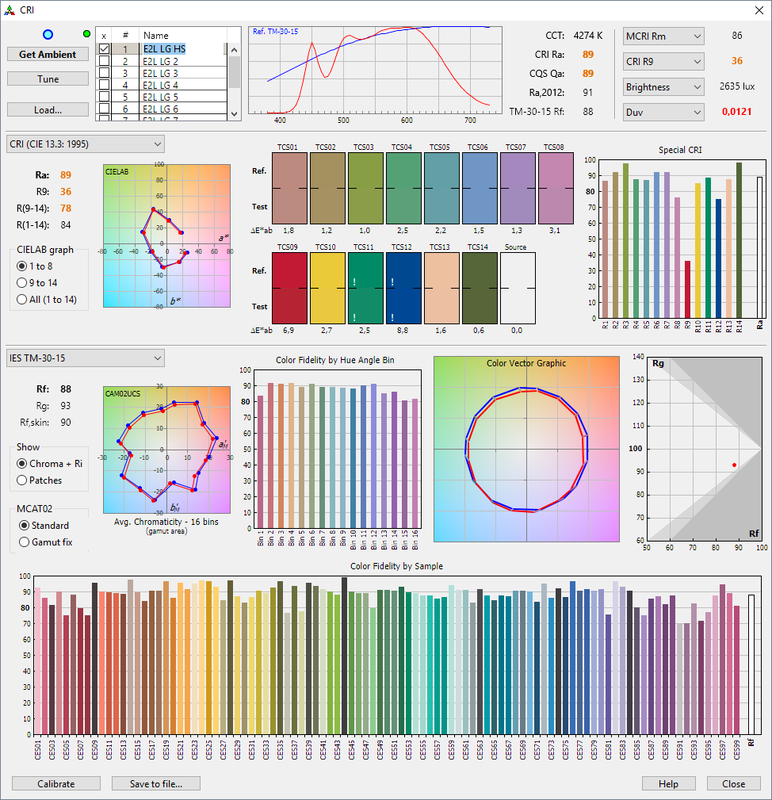 It’s also interesting that the color temperature is much lower than stated. Well yes, they measure it straight on, so basically the spill of the flashlight. 800K difference is still a lot though. Total flashlight efficiency is then about 65lm/W on high. Now I’m not so looking forward anymore receiving the E2L with these leds. Perhaps these leds work well in a mix with very rosy Nichia leds. Hmm. Maybe of use in a wide-spectrum light. *what happened to Jaxman ? Did Clemence scarf up all the good Nichias ? what happened to Jaxman ? Did Clemence scarf up all the good Nichias ? I’m not sure its good to imply that something bad “happened” to Jaxman. They took a chance on a new and unknown LED and I applaud them for that. Taking risks is how awesome new stuff gets found…sometimes. Its also how a company can set themselves apart from the competition. I mean now we know these emitters don’t have good tint, and we know that because Jaxman took a chance on them. I, for one, appreciate that. I agree, I bought six of these emitters just to try them out, after seeing them in person, I know I don’t like them, but that isn’t the fault of JAXMAN. 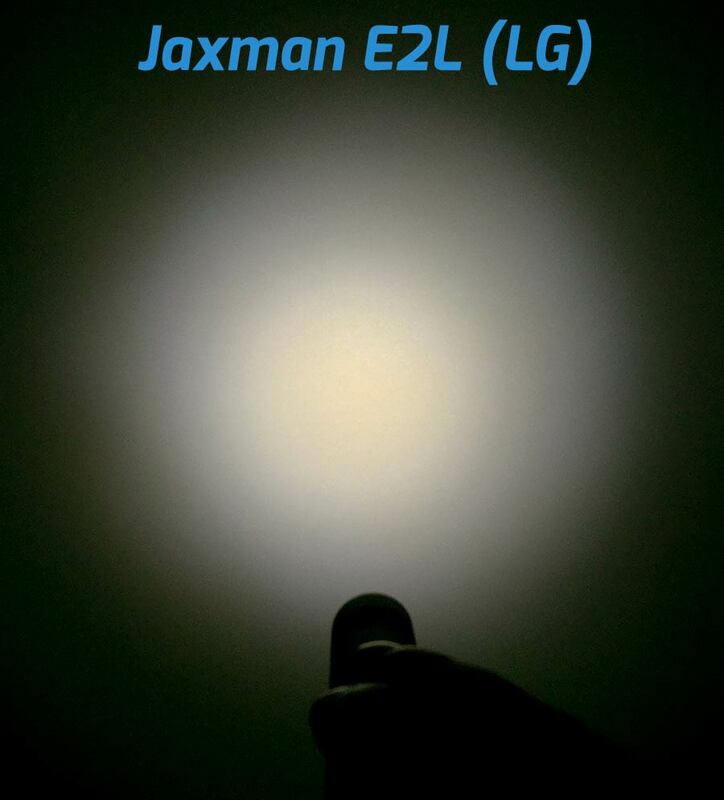 The JAXMAN lights are still the same top-notch lights, maybe just skip the LG option. I applaud them for making the emitters available. Plus, they would still work OK for lantern duty in something that doesn’t have optics. Thanks for this maukka. 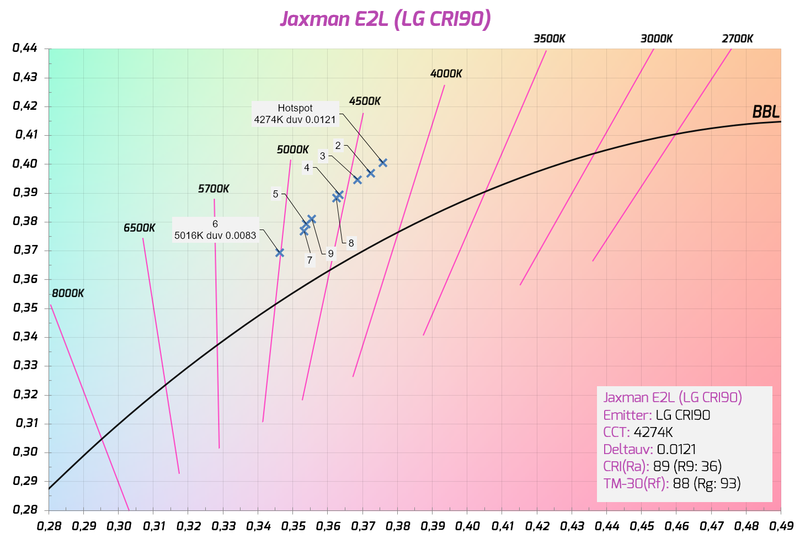 I am disappointed by the low R9 of the LED and I am happy for not impulse-buying the E2L even for its low price. To be fair to be LG, Cree’s lineup have consistently low R9 performance and are also known for their green tints. I guess Nichias are a safer (if not safest) choice for general use with reflectors and TIRs. This is a deal-breaker for me. I am tired of looking at greenish beams and I am quite happy with what Nichia has been giving so far. The only problem with Nichia LEDs is that they are not available in the tint and CRI combination that I am looking for. The proper industrial nomenclature is barf bag! LOL, just playing! I disliked the 4C (above the BBL) in the S2+, being too fried-egg of a a beam: too-orange hotspot (nowhere near what I expected 4300K-4500K to be), cool blue spill. My first indication that integrated it’s a nice CT was when I did a ceiling bounce, lighting up a room when the lightbulb blew. With a TIR instead of reflector, it’s very nice. Comes out a nice peachy-beige tint. OP, sorry if this is too off-topic. 5? Pfft. I stocked up on standard 20mm TIRs from Amazon, mostly ledworld and uxcell! as sellers. I got mostly the 20pax (each) of different types, some 10pax, from 5° through 60°, and recently of 90° and 120°. Can’t really speak about getting 1-fers of any type in combos. Got a bunch of 26mm TIRs from LEDsupply recently, too. Those were all 1-fers that I got like 2-3 of each or so. The S2+ will take a standard 20mm with or without the shoe. Without, anything will drop right in and sit flush on the mcpcb. With, eg, the one that has a XM-sized square cutout, will only fit with narrower-angles (pointier) and not the wider-angles (more bowl-shaped). The “bowls” press out more on the little tabs that hold in the TIR. When not pressed out so much, the tabs won’t interfere with the internal threads, so you can kinda force-fit the whole lens+shoe down the hole. Otherwise, forget it, you’d have to file down the shoe somewhat to get it to fit. Me personally, I don’t recall much difference with/without the shoe, so it may not be so critical. I’ve taken to just dropping the TIR down the hole, make sure it’s seated flush against the O-ring, then carefully screw in the pill most of the way, flip it over, make sure the LED is in the TIR’s hole, then snug it up the rest of the way. Beware, though, as the TIR is slightly shorter than the reflector, so you may have issues with battery contact. Might have to swap, say, the short spring for a taller stiffer one. With the shoe (implying narrower angle TIRs, up to about 60°), it adds an extra 1-2mm, so the springs will more or less make contact, albeit light, and not be too “flickery”. With the 90 and no shoe, it was almost unusable. As for the XP-L HI, it’ll fit, but the edge around the hole in the TIR won’t have that much to grab onto. My “technique” above becomes that much more critical to make sure the TIR rests around the LED, not on it. ……..The cellphone beamshot doesn’t convey the true horror, but gives an idea of the shift within the beam. I believe in one of the Jaxman threads here at BLF the Company owner lamented his difficulty obtaining Nichias for their lights. Not only is Jaxman to be lauded for establishing a presence here, the few friendly and constructive suggestions I offered in a PM regarding translation pitfalls were graciously welcomed, and duly employed. It was confirmation to see RMM become involved, certainly as good a ‘certification’ as one could want around here. If anything, Jaxman lights keep getting better, in all but one regard. We learned a lot when the single Nichia Hi Cri sw40 and sw57 lights appeared, many wanted him to return after flirting with the CREEs. It was at this point I believe he posted his comment regarding Nichias, saying he was thinking of an alternate brand. Obviously, 3 emitter lights are even more cost sensitive. OTOH, seeing D4s hit the market running with 5000k 9050 Nichias, and our in-house source appearing with them in a direct supply line to consumers, reflects on availability. Although many here are grateful for not needing to set aside funds for another ‘must have’ emitter, we are left to wonder if he was given a wide enough sampling as a basis for his purchasing decision, or if like my wife, he has some level of immunity towards hues most of us avoid?